I stayed up late last night with one of my best gals, watching the Oscars and eating yummy food that won’t make us sick. I’d say it was worth sacrificing a little sleep in the name of fellowship. Today is a work-from-home day so I allowed myself a little sleep-in, and am feeling pretty good despite my 1 am bedtime. 24 So, whether you eat or drink, or whatever you do, do it all for the glory of God. This verse is brief and succinct, making it an easy one to memorize. It applies to people of different ages and stages of life who are striving to make godly decisions. I do notice a tendency in our human nature to take words out of context and to a legalistic level, though, and I know that I personally need to be careful about that in certain areas, so I want to look at what this verse does and doesn’t mean. I think this verse is more about balancing freedom with humility rather than about giving us a rule to follow. When we look at the chapter of 1 Corinthians 10, and more specifically verses 23-33, we can see that verse 31 is instructing the Corinthians in matters of conscience as it relates to food and drink sacrificed to pagan idols. As the early church grew they had to navigate more of these issues of conscience and how to behave as they represented the Way of Christ. Paul’s instructions to the people can be tied to themes of the freedom we have in Christ (v. 23 “all things are lawful”), the unity of believers (v. 24 “let no one seek his own good, but the good of his neighbor”), and obedience to God (v. 31 “do all to the glory of God”). They were free to eat meat that had been sacrificed to idols, whether they bought it themselves in the marketplace or they were served such meat at someone’s home, because their hearts were set on God and not on the idols. But in cases where it might bring offense to someone else, or give the appearance of condoning idolatry, believers were to abstain from such food. It is not about the letter of the law here, but about the heart of the believer and the proper representation of Christ. Today we don’t need to worry about meat that has been sacrificed to idols, but the instructions in 1 Corinthians 10:31 still apply to us. From a simple, out-of-context reading it may seem that the instruction is to make everything in our life churchy, or constantly examine our actions to make sure we are glorifying God out of fear of punishment or failure. Don’t get me wrong; we should examine our actions and follow the Spirit’s guidance. A Christian’s actions should be different because of her/his relationship with Jesus. I can glorify God whether I am walking my dog or going through the checkout line at WalMart or driving my car. If I’m not using my time wisely when I’m by myself or with others, or if I’m acting without regard for others I am not acting in a manner that brings glory to God, and that is a problem. So those things are important, but I think the greater message of this verse is that we should balance our God-given freedom with God-given, Spirit-led self-control and responsibility. The message is to love God (which means obedience) and love our neighbors (which means humility and sacrifice) before we think of and serve ourselves. 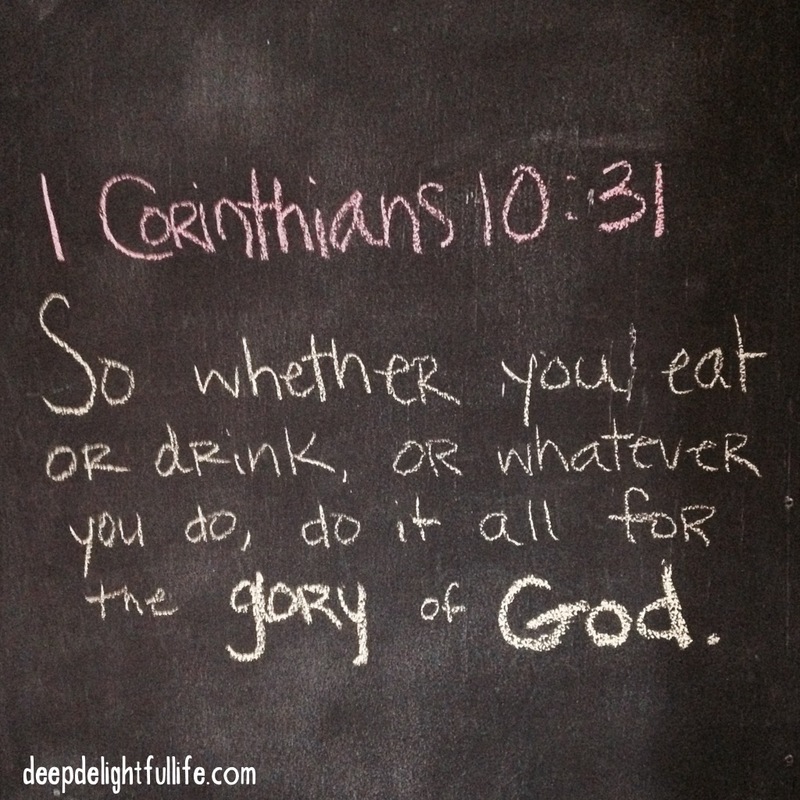 I’d love to know: what does “do it all for the glory of God” mean to you?